On 31 May 2018, PAMECA V initiated a roundtable between the School of Magistrates and the Security Academy, to discuss on the future collaboration and challenges of these educational institutions related to law enforcement. This round table gathered together, high level officials, representatives of the State Police, Security Academy, School of Magistrates and relevant EU Projects. The round table aimed at establishing a common agreement between the School of Magistrates and Security Academy to better coordinate the future activities related to the training of prosecutors, judges and police officers. 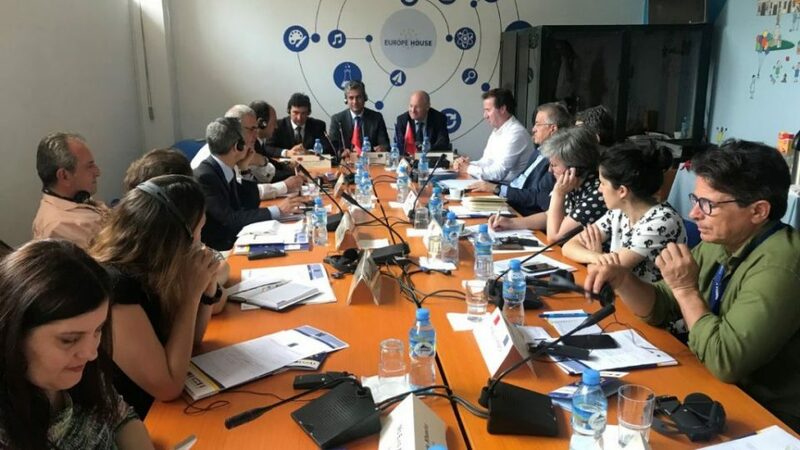 The participants highlighted the willingness of both institutions to coordinate training activities, and the necessity to institutionalize this cooperation. The exchange of respective annual Training Programs will be an instrument that will further enhance and coordinate institutional efforts in this regard. Prosecution and judicial police officers should be linked by a strong and mutual trust and collaboration in implementation of the law. Both institutions agreed to the need to closely follow trainings to exchange mutual experience, lessons learnt and increase their capacities in the fight against crimes. PAMECA V encouraged this preliminary meeting and will support the two institutions in the event of following up further steps. Moreover, both EU projects (representatives of EURALIUS V and IPA 2017 Countering Serious Crimes in the Western Balkans) offered their technical support.